Retail Pro International, developer of Retail Pro, the flexible retail management platform for specialty retailers, expanded market reach by 15% in the first quarter of 2016, rapidly increasing its worldwide footprint to 127 countries. Retail Pro International is broadening its reach across every continent concurrently. Newest wins include the following diverse and growing retail economies: Andorra, Anguilla, Antigua and Barbuda, Brunei, Cayman Islands, Czech Republic, Gabon, Haiti, Iraq, Israel, Latvia, Saint Kitts and Nevis, San Marino, St. Barts, Suriname, Syria, Timor-Leste, Trinidad and Tobago, and Ukraine. 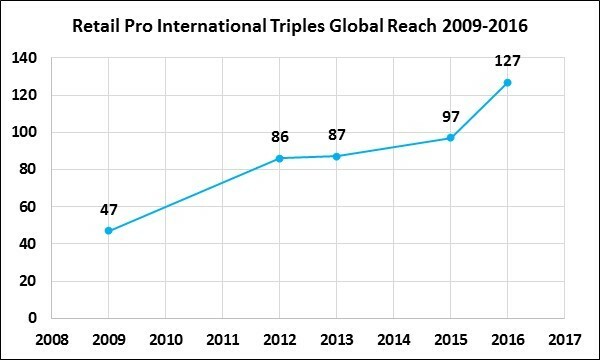 This growth marks a 7-year upward trend for the company, as global reach has nearly tripled since 2009, when CEO Kerry Lemos was first appointed. Today, Retail Pro software powers retail on every continent and is rapidly increasing in market saturation. “With Retail Pro, global brands like Puma, Under Armour, and Pepe Jeans can take their business everywhere there is opportunity and know they will be supported. Strong partnership in the Retail Pro ecosystem simplifies global expansion for retailers,” said Lemos. Globally local support for retailers using Retail Pro has been growing as well and includes the latest addition of a Retail Pro value-added distributor in Switzerland.